UHF Radio Frequency Identification (RFID) is an electronic tagging technology that allows an object, place or person to be automatically identified at a distance without a direct line-of-sight using a radio wave exchange. Applications include inventory tracking, prescription medication tracking and authentication, secure automobile keys, and access control for secure facilities. 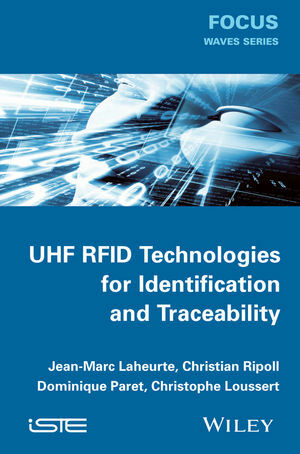 This book begins with an overview of UHF RFID challenges describing the applications, markets, trades and basic technologies. It follows this by highlighting the main features distinguishing UHF (860MHz-960MHz) and HF (125 kHz and 13.56 MHz) identifications, in terms of reading range, environmental sensitivity, throughput and safety. The architecture of the integrated circuits and the organization of the memory are then described. One chapter is devoted to the air interface protocol aspects, including coding, modulation, multi readers operation and anti-collision algorithms to manage the tag responses. Focus will be put upon the EPC Gen2 protocol adopted in the ISO 18000 Part 6. The core of the book will cover the design and manufacturing issues of RFID tags. The influence of the propagation medium (warehouse, libraries, etc. ), the tag close environment (bottles, linens, containers, carton boxes,etc.) and the coupling between tags will also be carefully addressed. The final chapter is dedicated to an industrial use case in the supply chain management, either in the retail inventory or blood traceability. Jean-Marc Laheurte is Professor and Head of the ESYCOM Laboratory at the Université Paris-Est Marne-La-Vallée, France.